dog tracks, originally uploaded by jahansell. Some of us stayed holed up indoors for the last two days, avoiding the snow and ice - both of which were a lot milder than predicted! We got maybe 7 inches total snow, not the 18 they scared us with, and the ice storm never really happened. However there are certain people that can't stay inside - the plow drivers, postal workers, the grocery store and gas station owners, and of course the dog walkers - they must go out no matter what the weather. 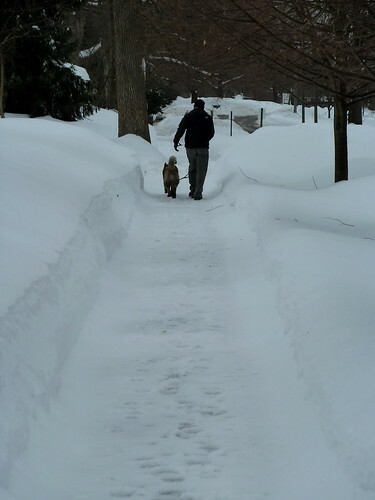 I caught up to this pair and noted how well-furred the dog was - when I observed she must love the snow, her owner demurred - tolerates, he said, not love or even like!